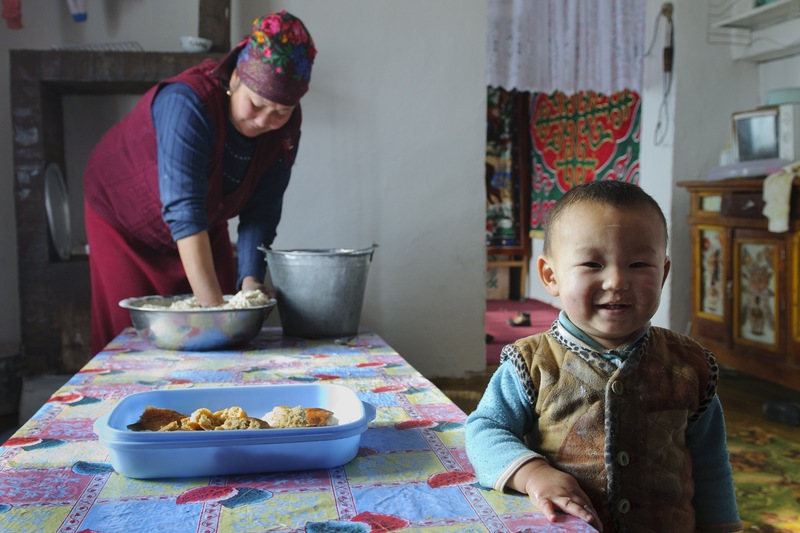 Since its independence in 1991, political volatility, economic shocks and frequent natural disasters have threatened development gains in the Kyrgyz Republic. Although the country is on an upward development trajectory, it still faces serious challenges. The poverty rate decreased from 38 percent in 2012 to 31 percent in 2014, with about 1.8 million people still living below the poverty line. Two-thirds of the country’s 6 million multi-ethnic population lives in rural areas where the poverty rate is 33 percent, as of 2014. Almost 13 percent of children under age five suffer from stunting and 43 percent from anemia. The country’s high dependency on the import of basic food, particularly wheat, and the high price of domestic wheat flour continues to impact the most vulnerable food-insecure households, which spend more than half of their budgets on food. School meals – WFP began a four-year school meals optimization project in 2013 to strengthen the Government’s capacity to improve the quality and efficiency of the existing national school meals program. This project enhances Government capacity to manage school meals, diversifies menus, supports the upgrading of school infrastructure, improves procurement efficiency and develops school gardens. WFP supplies fortified wheat flour, while the Government covers the remaining 87 percent of costs. By April 2016, WFP had increased the number of schools from 200 to 261 and children assisted from 40,000 to 60,000. WFP is working with the Government and other NGO partners to develop a more sustainable national school meals program by 2025. Long-term resilience building – WFP launched a productive safety nets and long-term community resilience project in mid-2014 to enhance the Government’s capacity to contribute to sustainable food security, nutrition and resilience among the poorest and most food-insecure groups. The project focuses on rural development, social protection and disaster risk management and climate change adaptation. The project supports more than 300 different activities in 80 sub-districts across the country and aims to impact 274,000 people both directly and indirectly across the life cycle of the project. Asset creation and restoration activities involve the construction of disaster mitigation structures, roads, irrigation and drinking water systems. WFP works particularly with vulnerable women to increase incomes through vegetable production and the creation of fruit plots. Technical assistance n- WFP provides capacity development and technical assistance to the Government, particularly the Ministry of Social Development, including support for policy formulation and social protection programs. Support has also been provided with the introduction of the National Food Security Atlas and an Inter-agency Technical Working Group on Price Monitoring for Food Security. WFP supports the development and implementation of the National Food Security and Nutrition Programme, jointly with FAO and UNICEF.